The Occupational Safety & Health Administration (OSHA) is getting more stringent, both with regulations and enforcement, on machine guarding violations. They are targeting industries with higher risks of potential injuries from machinery. Despite this move by OSHA towards greater expectations from industry, there is still a large cultural gap between employers and original equipment manufacturers (OEMs) regarding who is ultimately responsible for ensuring that the machinery is guarded in compliance with OSHA regulations. In my years of consulting our clients in regards to OSHA and General Safety compliance matters, there has been one notion that my clients keep telling me, “I don’t understand why this machine is unsafe” or they do not fully understand why they have received an OSHA violation. Another phrase I commonly hear is “The equipment came from the manufacturer that way.” Through some research, it emerged that several equipment manufacturers and distributors were selling equipment while stating that they “meet OSHA requirements”, and yet accidents were occurring and OSHA violations were being distributed. Machine guarding is used as a precautionary safety feature on machinery and other pieces of equipment. It is a shield or device protecting from accidental contact of body parts with hazardous areas of a machine and can also control hazards like chips and noise from exiting the machine. A guard controls the interaction between the operator and the machine, and can be a significant factor in optimizing a machines performance. Examples of guarding solutions that have been used in a variety of industries can be seen below. Understanding machine safety standards can be a challenging step in reducing risks in the workplace. Although the requirements for machine and employee safety may seem endless, there are ways to ensure proper safeguarding for employees. OSHA regulations state “One or more methods of machine guarding shall be provided …”1. Due to this initiative, any gap in machine guarding and overall safety on a piece of equipment falls on the shoulders of the employer. As outlined in American National Standard Institute’s (ANSI) standard B11.19-2010, The Performance Criteria for Safeguarding, it is the role of both the OEM and the end user to conduct a risk assessment in order to determine the safeguarding that is required for the equipment. One thing to consider about the OEM’s risk assessment is that it is impractical to expect a machine designer to foresee all potential hazards associated with equipment setup, operation, maintenance, and placement within a facility. The end user should conduct a risk assessment, separate from that of the OEM, as a part of due diligence for recognizing and reducing risk. There is some responsibility on the side of the OEM however. While the OEM is typically unsure of the final location and process staging that the employer has designated for the equipment, the OEM should consider any foreseeable use and misuse of the equipment, as well as the potential point of operation hazards for those who may come in contact with the equipment. What Makes Machine Guarding So Difficult? Facilities and operators rely heavily on these safeguards being able to perform multiple functions. These safeguards are expected to not only prevent the accidental contact with hazards and moving equipment, but they are also expected to be easily removed and secured for maintenance, protect the equipment itself from falling objects or other moving equipment, and not create any additional hazards. Of course another significant goal is that these safeguards don’t prevent an operator from performing his/her job efficiently and effectively. As specified in ANSI Standard ANSI B11.0-2010, “The user shall ensure that additional safeguarding is provided and installed as determined in the user risk assessment.” In many cases employers can find it difficult to assess risk as sometimes the employer does not poses the expertise to conduct a proper risk assessment. Conducting a risk assessment of new equipment is not only required, it is a great method of due diligence for determining the risks present for that piece of equipment as well as for that section of the process. If hazards are not identified than it is unlikely they will be protected against. Along with the intricate principles of machine safety, employers can sometimes be misled by OEMs and/or machine sales representatives. The phrases “OSHA Compliant” and “Meets all OSHA requirements” have been misused by OEMs and machine sales representatives in order to sell equipment to employers, who honestly may not know any better. OSHA does not certify equipment to be “compliant.” If an OEM claims that a piece of equipment is “OSHA Compliant” or that it “Meets all OSHA requirements”, you should obtain any risk assessments that have been conducted on that equipment, and check for any “UL” (Underwriters Laboratory) and/or NIOSH (National Institute for Occupational Safety and Health) stamps on the equipment. Those types of markings will help indicate that the equipment has at least undergone a safety inspection by a reliable agency. Any risk that is identified should be mitigated to ensure a safe work place. If there are hazards present and identified, but they were not mitigated, abated, or somehow guarded due to difficulty of guarding applications or because it is simply too expensive, they could be considered Willful violations by OSHA and any associated fines could increase exponentially. The knowledge, ability, and confidence to perform a risk assessment on equipment is by no means easy. One has to keep in mind the potential risk present on the piece of equipment, as well as understanding that employees do make mistakes and the presence for serious injury is always present. For these reason is can be extremely beneficial to employ and cooperate with a 3rd party specialist. The specialists include machine designers, maintenance personnel, consultants, and an OSHA Compliance Assistance Specialist. 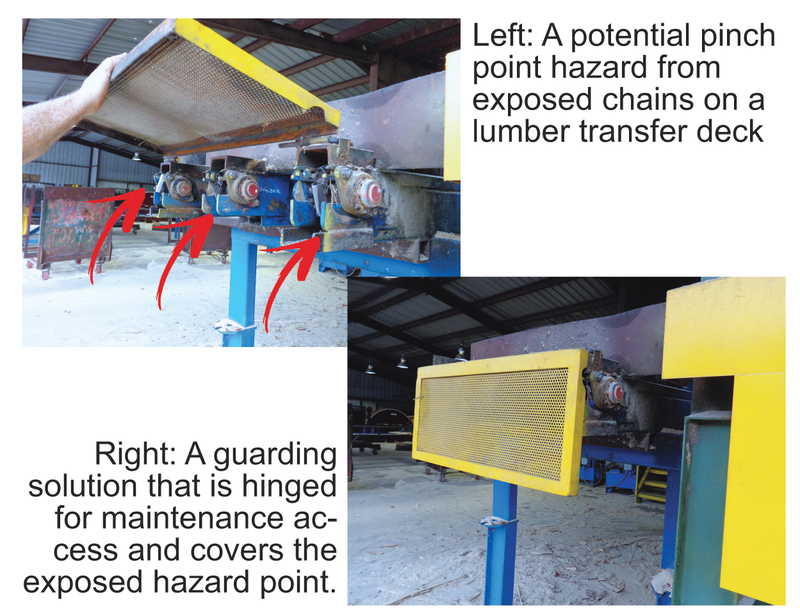 While a 3rd party specialist will cost the facility, machine guarding specialists and safety consultants can often find several potential violations and potential hazards that many maintenance personnel may overlook. One thing that a consultant is particularly good at is the ability to not simply focus on OSHA standards, they are able to use their knowledge of other applicable consensus standards as well as their experience working with both government agencies and other industries. Consultants and other specialists, being hired by the facility, can explore equipment and guarding’s applicability for that specific facility’s needs. Cost, difficulty of the safeguarding solutions themselves, functionality of the safeguards in relation to the equipment and the operator are all very difficult for someone like a 3rd party specialist, or even a corporate representative to fully comprehend. One thing that each facility should not overlook is the utilization the employees and staff already employed by the facility. A facility’s employees have hands on comprehension of the equipment, the process, and are often very aware of potential hazards on the equipment that they see and use on a daily basis. Getting input from those whom actually operate the equipment, and sometimes are the ones constructing and sometimes bypassing the safeguards, is a vital tool when implementing guarding solutions in a feasible way. This can also ensure that the guarding solutions being implemented are safe, easy to operate and replace, and that as much common sense went into the design and placement of the safeguard as possible. It is everybody’s responsibility to change the culture of safety and to look at it as not just a means to prevent costly accidents and citations, but to look for the safest solution at every stage of the design and implementation processes. While productivity and efficiency are important, the most vital part of any facility is the safety and well-being of its employees.